On Sunday morning, NFL Network broadcaster Rich Eisen’s voice broke as he reported the death of his good friend, with whom he worked on “SportsCenter” broadcasts. “I love this man,” Eisen said. Born in Chicago, Scott attended high school in North Carolina. After graduating from the University of North Carolina in 1987, Scott worked at three TV stations in the southern U.S. before joining ESPN for the 1993 launch of its ESPN2 network, hosting short sports update segments. Scott went on to cover countless major events for the network, including the Super Bowl, NBA finals, World Series and NCAA Tournament. He also interviewed President Barack Obama, joining him for a televised game of one-on-one. In 2001, Scott returned to Chapel Hill as the university’s commencement speaker. – RICK FREEMAN, AP Sports Writer [Reprinted by The DeSean Jackson Foundation, 1/6/2015]. Must I start off by saying this man was one of the “Few Real Sports Broadcasters” that I had a chance to meet .. Stuart Scott knew the “Game” and knew how to treat & respect the Players for what we did !! Stuart always kept it real regardless of the subject matter; and, that is why he gained my Respect!! It was a honor to have your friendship STU .. I also want to send my heart-felt sympathy and prayers to the Scott family and his associates at ESPN. Trust in the Lord and know that he is in control even when we thing he is not!! 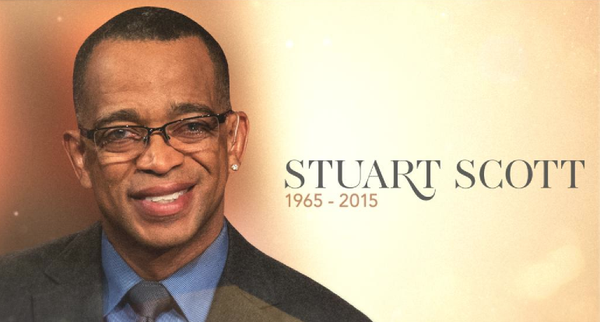 Rest In Peace, Stuart.